A sermon preached by Christopher L. Webber on November 11, 2012, at St. Paul’s Church, Bantam, Connecticut. I went out one day last week to bring in the mail and I found thirteen items in the mail box – every one of them a catalog. It’s that time of year, isn’t it? The leaves fall from the trees and the catalogs fall from the mail box. I probably get more Bible-themed catalogs than most people and I got one catalog that advertised a “widow’s mite” bracelet – which brings me to today’s gospel and the story of the widow’s mite. 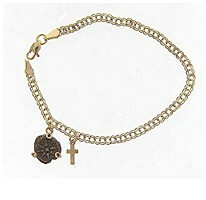 To make the widow’s mite bracelet they take genuine coins and set them in silver and sell them for $99.95. I guess that was a few year’s ago because when I looked on line last week I found them from Amazon for just under $500. The widow in today’s gospel wouldn’t have been able to afford a “widow’s mite bracelet.” But what occurred to me was this: if every member of the congregation would put just one – not even two – just one of those widow’s mite bracelets in the offering each week, we could double our budget and do wonderful things. Today is Stewardship Sunday and you might think that’s on purpose and that today’s gospel is about stewardship, the right use of our possessions. Well, I don’t think it was planned and I’m not sure it really is about stewardship as we often understand it. But I’ll come back to that. Jesus was teaching his disciples as he often did about wealth and poverty. You can read about it in the Bible and you can read about it in today’s paper. Some things don’t seem to change. But all the studies I’ve seen show the rich getting richer and everyone else being left behind and that’s not good for the church. It may be good for the banks and insurance companies but not the church because there have been numerous studies that show that those with the most give the least. But what do people with all that money do with it if they don’t give it away? Some do, of course; but a lot of them don’t. But what do they do with it? Does anyone really need ten zillion dollars a year? And can anyone be so smart, so skilled, so valuable and irreplaceable as to earn that kind of money in the first place? That’s the background for the story of the widow’s mite. That story tells us how Jesus sat down and watched people putting their money in the temple offering. Imagine that: Jesus watching as the plate is passed! So Jesus was watching as the scribes who had probably just made a deal to defraud a widow of her inheritance were putting in their tithe: ten per cent of what they had stolen. But Jesus was watching. Now, this is politics and this is economics. Preachers are supposed to avoid such subjects and stick to what they know about. Well, I majored in politics and economics in college so I do know something about it but I’ve spent much more time studying the Bible and you can’t do that without encountering politics and economics on every side. But you read the papers and watch television so I’ll let you make the connections. You know the standard question: What would Jesus do? I think what he would do is what he did do: teach, point out to his disciples what they could see in front of them, ask them what they thought of it. There was also the day when he acted, when he drove the money changers out of the temple. It was probably the most aggressive action of his whole ministry. Who would he drive out today? I’ll let you think about that because we might answer it in various ways. What would Jesus do today about wealth and poverty? I’m not sure what he might do, but I’m very sure what he would say because we know what he did say. He said, “Wealth is a snare. Money is a snare.” He didn’t say, “The love of money is the root of all evil.” But it’s in the New Testament and a kind of summary of Jesus’ teaching. The only good thing he ever said about money was about the widow’s mite. I read a piece in the New Yorker a while back about the young people of the Ivory Coast in West Africa whose only dream is to get to America. Why? Because they watch television and they see a society of incredible wealth and people who indulge themselves in ways a young west African can only dream about. It’s ironic that there are other Americans who leave all that behind and go to West Africa to try to bring modern medicine and education to people who lack everything. But the tragedy is that they make far less impact on Africa than the ones who stay behind and pile up their wealth and create the picture the world sees on television of a society concerned only for itself and using its strength and wealth only to increase its own wealth and security. From their point of view, that’s all of us. What would Jesus say? He’d say what he did say: “those who devour widow’s houses will receive the greater condemnation.” Those in Washington, those on Wall Street, those anywhere, who work to acquire the resources of the poor to increase their own comfort are condemned. They will stand before the King on his judgment seat and have nothing to say when they are asked why they didn’t respond to Jesus’ presence in the poor, the hungry, the homeless. They are condemned, and the poor widow is praised. The gospel reverses the values of society – its own society and ours as well – and we need to ask ourselves how it can be that this so-called Christian nation, a Bible-reading society, doesn’t understand the gospel, doesn’t know the judgment it faces. It all comes back eventually to some very basic stuff. It’s a matter of who God is, of what we believe about God, and what that means for the way we live. It’s the ABCs of Biblical faith: God is first of all a Creator: Genesis, Chapter 1. God created a universe and created human life and placed us here with responsibility for it, to care for it. It’s a matter of stewardship. Why does God create? To enrich himself? Don’t be silly. What does God need? No, God creates out of love. Creation is always an act of love, of giving, of self-expression. God is first of all a giver and God made us in the image of God and calls on us to be like God: to give, to love, to share this good earth. I have sometimes suggested that we should think of stewardship from the top down instead of the bottom up. Take today’s widow as an example. She didn’t stop to figure out a tithe or to plan a budget for the week. She just gave all she had. I think that’s the model the Bible gives us for stewardship. You take it off the top not the bottom. God first; self second. Now probably you do need some for yourself: groceries, clothes, the mortgage, the stuff you need to survive. And since in this society you can’t count on the government or church to pay your medical bills or support your golden years, you probably need to salt some away. But start with 100%. That’s where the widow started. That’s where God starts. Start with 100% and decide whether you can afford to return it all to God right now. Eventually there’s no choice; you can’t take it with you – though as a bishop I used to know liked to say, “You can’t take it with you, but you can send it ahead.” It all comes back to God sooner or later. You never see a Brink’s truck following the hearse. Sooner or later, you have to give it away or leave it behind. But now, when you have a choice how much do you need to keep? If not 100% now, then what? Maybe you can’t even give back 90%, maybe not even 50%, but 10% from that point of view isn’t asking much at all. I wonder whether we as a society are in somewhat that position, where we feel as if God has given us so much we can’t afford to respond fully. They’ve done studies, as I said, that show that the higher your income level the less proportionately people give away. The rich are less generous than the poor. Those with the most ability to give, give least. It makes no sense, but that’s what human beings are like. It’s why God needed to give us a specific example of the way we are meant to live. Jesus is more an example than a teacher, and more an example in his death than his life. The cross is the symbol of our faith because it sums up the full meaning of God’s giving: giving all; holding nothing back. The cross is not a tithe and certainly not a tip or a minor gesture. By the time we come to the end of the Christian year we are supposed to understand this. We have heard of Jesus’ birth, we have read about his fasting and temptation, we have taken part in the events of Holy Week and Easter, we have spent the time since then hearing week by week of how he healed the sick and fed the hungry; we’ve heard again the parable of the Good Samaritan and the Prodigal Son. And it’s all about giving, it’s all about stewardship, it’s all about the right use of the gifts we are given. And what better way to come to the end of the Christian year now only two weeks away than with the story of this widow who gets it, who knew the gospel and lived it to the full. She understood it. Do we?